1. Download Patch.rar [http://www.megaupload.com/?d=0WMO5NJP] and get a Patch.exe file from the RAR archive. If you use a DSTT, you can run the game by getting infolib.dat and extinfo.dat from the latest kernel below, and copying them to your TTMENU folder. In this case, you must not patch the ROM file by using Patch.exe. If you use a legacy R4, you may want to use YSMEMU with those files. Download game from above links. - Choose then save type as no$gba (2 one). - Put the saved file in the battery file of No$zoomer. then start up the game in the no$zoomer. - Go to options config. and change reset/startup entry point to gba bios (nintendo logo). Note: Copy any of the above Digimon Story - Lost Evolution (Japan) rom download links and paste it into your browser to download. when US or Europe version release?? Also US/EU release is TBA. Most likely when Xros Wars is over or is about to start in USA. Which will probably be 1 - 2 years. It will be out by midnight. Apparently someone already has it on a japanese forum. I saw a post on GBATemp that a guy has it. 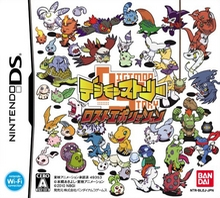 Various people have the game already as reported in http://gbatemp.net/t238118-ds-4998-digimon-story-lost-evolution-japan?st=15&gopid=2952983& why is it taking so long for here? can someone make a fix for nogba? No$GBA has not been updated in some time. YES CAN SOMEONE MAKE A FIX FOR NOGBA?????? How about DesMuMe emulator? Just test it right now! Tried it on DSTT, had a -4 load error. Anyone know how to get around that? WE NEED A F***** FIX FOR NO$GBA PLEASE GOD!!! After the war numemon rays can not go forward from where you can help? Hey , I have a excellent news. Wood R4 1.10 in GBAtemp arrive!! This fix Dragon Ball , Digimon, Ghost Trick and more and more games!! Read in GBAtemp, the LIFESAVERS!! Download game from this site. some1 have english patched rom? Tried on iDeas and Acekard2i and same thing =/ i am guess the game needs fixed. WE NEED A FIX FOR NOGBA IS THAT THAT IS IMPOSSIBLE? This is game numemon fight later is not working?? digivice menu''start button'' is not working? bk patch results in no change so nds? im stuck in the part after u get the digifarm WHAT TO DO NOW??????? Don't be stupid. There's no English patch. The game just came out. Translation patches take months to make, sometimes years. choose then save type as no$gba (2 one). hope it works for ya all! is this working with nogba? grrrr, when can i enjoy this in english? why i cant event play that game? even i have download the game but still cant play on No$GBA! anyone know how and why? I keep getting a -4 load error on all of the links! i've tried em all!! How can i play this!! please help! In order to get .nds, you need to extract .rar through WinRar! do have any way to fix it for "r4 sdhc revolution for ds" ?